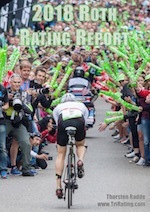 If you want to know a lot more details about Challenge Roth, its history, the courses and the strengths and weaknesses for each Pro athlete (plus interviews with the main contenders), download my “2018 Roth Rating Report“. Here is some information on race day and some late updates. Through the Challenge Roth homepage (https://www.challenge-roth.com) , you will be able to access live streams in German and English. The streams will start at 8:30 am CEDT, two hours after the start of the race. There will be text updates on Twitter and on the Challenge Roth homepage. For those who are able to receive Germany TV, there is going to be a summary of the race on Bayern3 from 15:30 to 16:00. This will also be available on the Live Stream with German and English commentary. I will be commentating in the English live stream and I hope that a lot of readers will join me. If you’re watching the race, please let me know through email (contact info in the right-hand sidebar) or Twitter (@ThRadde) where you are watching from and send me any questions you may have! The Course Rating for Challenge Roth is 20:51. Challenge Roth has a total prize purse of 200.000 US$, paying 10 deep. I’ve also written a number of more detailed posts about the chances for most of the main contenders, check out the links below. Ivan raña also confirmed that he will start! I think Joe Skipper also races IM Frankfurt one week after. Joe is on the list for Frankfurt, but I think he’ll only race there if his Roth race ends very early with mechanical issues (hopefully not!!). If he’s doing an IM after Roth, my guess would be Hamburg (four weeks after Roth) but it’ll all depend on how he’s going to recover from this weekend’s race.